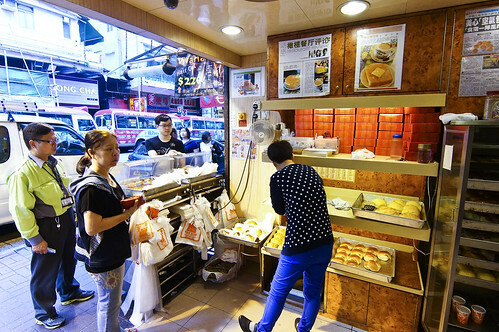 Hong Kong is very well known for two kinds of pastries – Egg tart and Polo Bun (Pineapple Bun 菠蘿包). 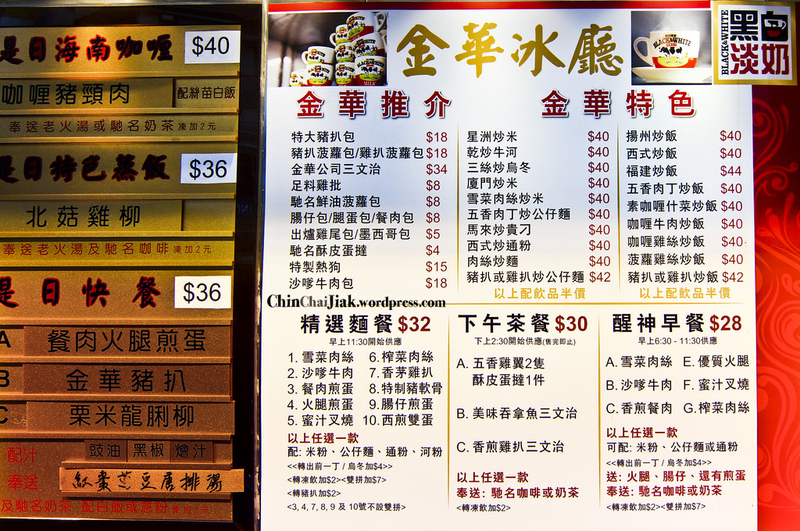 According to online sources, you can get the best of both worlds at Kam Wah Cafe. 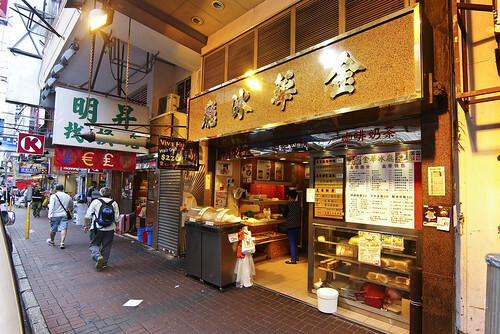 They are very famous for their freshly baked Polo Bun and Traditional Egg Tart. 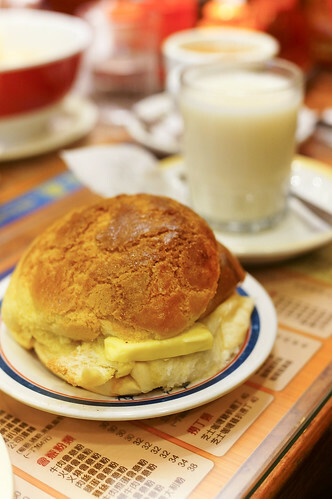 People vouched that they serve the best Polo Bun in the whole of Hong Kong. As I am rushing to Australia Dairy Company for breakfast round two, I just ordered their signature dishes – their award winning Butter Polo Bun and Egg Tart, and one additional french toast. Oh yes, Kam Wah also has a minimum order of one beverage per customer. Polo Bun (which means pineapple bun), has no pineapple content in it. It was named as such because of the appearance resembles a pineapple (although i am quite sure Kam Wah’s don’t look like a pineapple at all). The top of the bun is made of dough that is in similar nature of a sugar cookie. Kam Wah’s Polo Bun is served fresh from the oven once every 10 minutes in the morning. That’s how fast and furious it’s selling. Apart from dining in, many people just order their Polo Bun as takeaway. Morning is also the best time to catch their most fresh and piping-hot Polo Bun. I ordered their Butter Polo Bun (S$1.40) with a thick slice of butter sandwiched in between the bun. I instantly smell the fresh-from-the-oven fragrance of egg and bread when the bun is served. But my usual ritual (photo taking) stopped me from taking a bite instantly. Despite that, the almost-a-centimeter top crust is still downright crispy. The crust layer is also not overly sweet. The melted butter compliments the warm fluffy center and introduce a savory taste that further enhances the flavor. It also has a tinge of lemon/orange peel fragrance. i give this bun a thumbs up! Their french toast is not bad, and the middle is spread with peanut butter. But i had better one, which i will write on later. I wasn’t too impress with their egg tart filling though, as I have my own preference of how an egg tart should taste. Most importantly the custard must be bursting with egg fragrance and the custard should also be really smooth and soft. Kum Wah’s version lack in this two aspect. Their milk tea is quite good. Smooth and fragrant, and most importantly, they are in the old school Dairy Milk Cow Tea Cup. 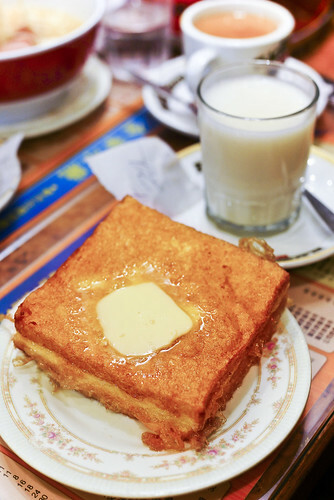 Kam Wah’s version is the more traditional Hong Kong style egg tart. The texture of the custard is not as soft and i thought it taste a little artificial. However, the tart crust is a totally different story. The crust literally crumbles in my mouth and I really love it’s texture. The crust doesn’t taste sweet, which rightfully should compliment the custard very well. If not for it’s custard, I would really recommend this egg tart. It’s also rather value-for-money at less than S$0.70 each. I encountered something not very pleasurable at Kam Wah. The cafe is really crowded and I carry a rather bulky camera bag with me (i was slinging it in front) while I was going into the cafe. One service staff was rushing to attend to her customer and I think my camera bag was in her way and she just pushed and shoved my camera bag to the side using her hand without batting an eye. I think this is one kind of service that you will get in Hong Kong cafe so just don’t be alarmed when it happens. 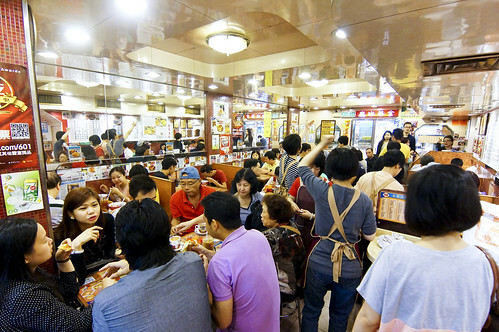 For Hong Kong first-timer, you may want to read up my “Eight must-know about Hong Kong Cafe Culture“. That aside, this is my second visit to Kam Wah. I didn’t order their Polo Bun the first time and I thought there is nothing fantastic about this cafe. But then it’s another story after trying it. So my opinion is, the Polo Bun is worth the calories for sure and be sure to pop by for it, even as takeaway. However, I will leave it to you to decide if you would like to have a full meal at Kam Wah. For myself, I just try what i think is deserving and i visited Australia Dairy right after this. 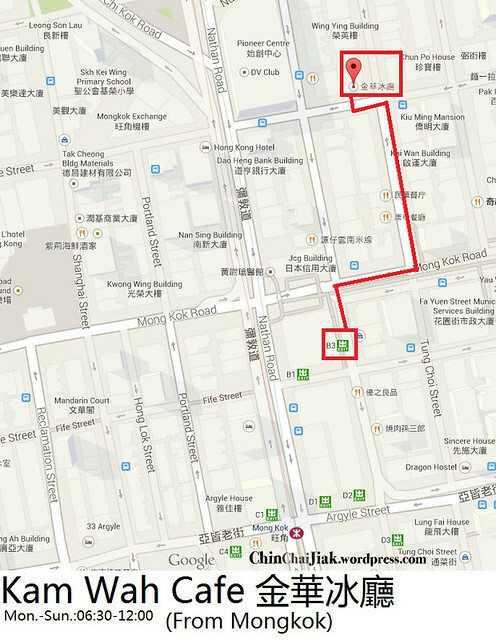 Kam Wah is actually in between Prince Edward and Mongkok station but i went from Mongkok station. 2. You will see an escalator leading up to a bridge. Go up the escalator. 3. 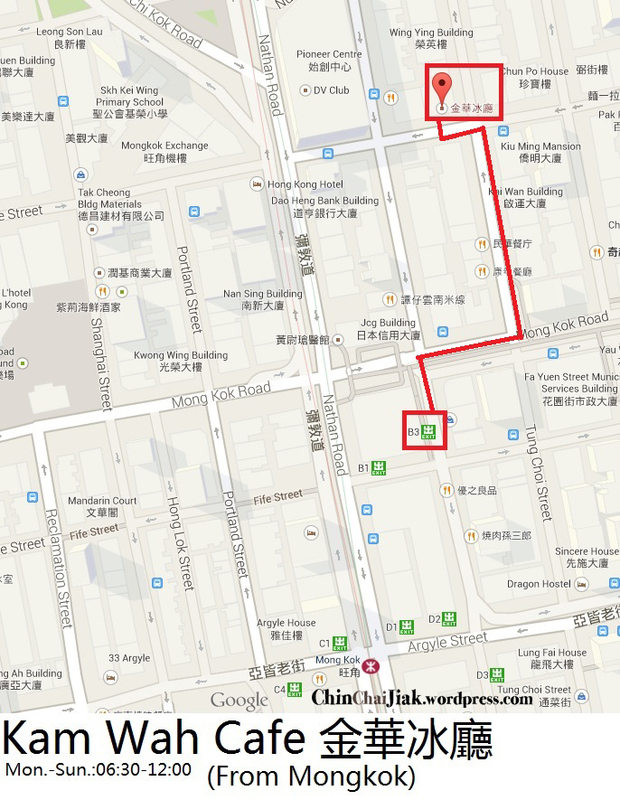 As shown on my map, you are walking along Mong Kok Road, on a pedestrian bridge above Mong Kok Road. 4. Turn to the left and goes down that escalator to reach ground floor. 5. Walk straight until you come to a T junction. 6. Kam Wah Cafe is on your left. 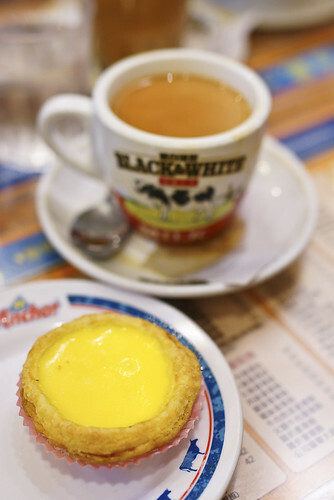 This entry was posted in Dishes - Egg Tart, Dishes - Polo Bun, Good For - Cheap Eat, Location - Mongkok, Type - Hong Kong Style Cafe and tagged Award Winning Polo Bun, Char Can Teng, Egg tart, 金華冰廳, 金华冰厅, 菠蘿包, Hong Kong Best Polo Bun, Hong Kong cafe, Kam Wah, Kam Wah Cafe, Pineapple Bun, polo bun. Bookmark the permalink. ← The Korea’s famous Yoogane Chicken Galbi is in Singapore! 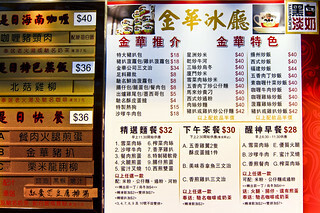 Very interested with kam wah cafe but..the menu i dont understand the chinese language. Is there an english menu or picture?